Being a student at EGBOK gave Chanthy the ability to create a future for herself and her family that she had never thought possible. By providing her with the necessary tools and skills, Chanthy now has dreams as big and bright as her radiant smile. Chanthy wears her beautiful smile proudly, and she has the uncanny ability of always getting others to smile as well – no matter how bad their day may seem. This ability to invoke laughter and smiles in everyone around her is not only a quality that makes Chanthy unique, but it also aids her in accomplishing her goals and succeeding academically, professionally, and personally. Her positive attitude and glass half-full perspective have allowed Chanthy’s true talents and personality to shine, thereby giving her the confidence and ability to create a dream for herself and her life that she never had thought possible before coming to study at EBGOK. Chanthy’s mother is extremely supportive of Chanthy’s decision to come study at EGBOK and states that she is very happy that EGBOK is helping Chanthy, especially because she is a single mother and therefore the sole provider for her family by tending to their small rice field. Chanthy’s mother says that their situation is a difficult one, but that she hopes that Chanthy will be able to help supplement the family income with her new job in hospitality. 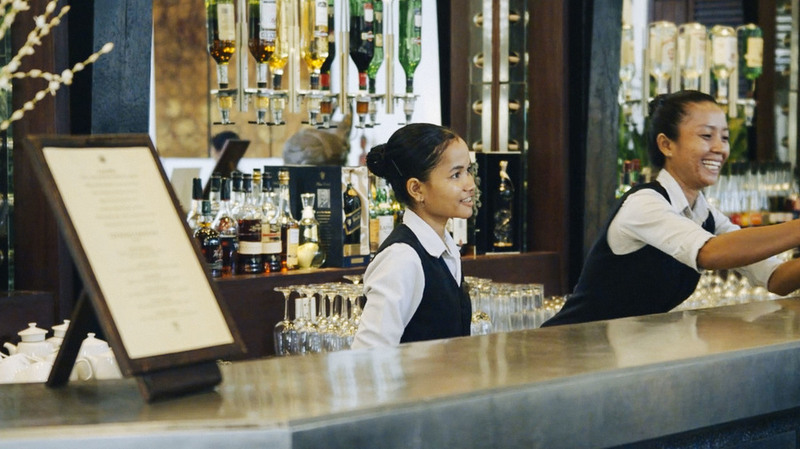 Her smile is so contagious and her personality so endearing that she is a favorite among staff and guests alike at the Sofitel Angkor, a top-tier hotel in Siem Reap. Despite the fact that Chanthy is not yet fluent in English – she entered the program speaking no English at all – she was nonetheless still able to land a job working at the restaurant at one of the top hotel chains in the world. Her supervisor has only praise for Chanthy, saying that she always follows the standards with precision, that she is an excellent listener and, perhaps most importantly, that she is flexible – a quality that is extremely important in the hospitality industry. Chanthy’s attitude allows her to impress her supervisors while at the same time also attending to the needs of the guests with grace. Chanthy says that she loves her job and very much enjoys learning about French cuisine – something that she never even knew existed while growing up in a rural village. This love of French cuisine has even inspired Chanthy’s dream to someday open her own restaurant, which she envisions to serve a mix of Khmer (traditional Cambodian) and French delicacies. From a difficult childhood to a top-tier hotel, Chanthy’s positive attitude and aptitude for learning have taken her far down a road toward future success in whatever she can dream to be and do. Being a student at EGBOK provided Kea with the chance to shape his own future. He grew up in extremely poor conditions and with a physically and verbally abusive stepfather – a man his mother married after Kea’s biological father walked out on them when Kea was only 3 years old. Kea often ran away for days at a time to try and escape the abuse, and he eventually left his mother to go and live with his aunt, uncle and their 5 children. However, just as things finally seemed to be getting better for Kea, his aunt and uncle were brutally murdered. After their deaths and with no one left to take care of him, Kea went to the capital city of Phnom Penh where he collected discarded trash on the streets to survive. He was eventually taken in by an orphanage. Kea’s adjustment to orphanage life was not easy. He struggled with trying to fit in with the other children and often got into trouble for fighting with the other boys. After some time, however, things began to improve and Kea was able to settle into life at the orphanage. When Kea was 18, he took an EGBOK Introduction to Hospitality Course that was taught at the orphanage. It was this course that inspired Kea interest in and desire to pursue a career in hospitality. After completing the course, Kea decided he was ready to leave the orphanage in order to pursue his dreams and establish a life of his own. After getting accepted into the EGBOK program, Kea left Phnom Penh for Siem Reap, where he became a student in EGBOK’s first student class. As a student at EGBOK, Kea accomplished a great deal, excelling both academically and professionally. Upon graduation, Kea was offered a job to work at one of the top international hotels in Siem Reap, where he continues to work today. He has received a number of promotions and salary increases since beginning his employment there, and his monthly income now allows him to support not only himself and his soon-to-be wife but to also send money to his siblings and mother. Despite Kea’s tumultuous and traumatic childhood, Kea is a positive and charismatic young man. He is ambitious and motivated, and dreams of one day owning his own Italian restaurant. As a student at EGBOK, Veasna built her self-esteem and found the confidence that she never knew she had. Veasna had always been a friendly, though rather shy, young woman, and before starting her training at EGBOK, Veasna believed she knew what her future would entail – living in the same village she grew up in, farming the rice paddies around her home and cooking for her family. However, as it turned out, the future actually had something very different in store for Veasna. Growing up in the rural Cambodian countryside, in a village without electricity or running water, gave Veasna little opportunities to study or learn. Veasna had settled on the notion that her life would take the same path as her parents and grandparents, and that she did not have much choice in this matter. However, after taking the EGBOK Introduction to Hospitality Course offered in a nearby village, Veasna decided to take the chance and apply to attend EGBOK’s Training & Internship Program. Despite speaking almost no English, her motivation and determination helped her get accepted into the program. Shortly after, she moved out of her small rural village to the city of Siem Reap to begin her studies. Veasna learned to speak English and use a computer. After graduating in 2013, Veasna found a job working in food & beverage service at one of the top-tier hotels in Siem Reap. Despite the fact that she says it is harder for her to learn new things than some of her EGBOK classmates, she is highly motivated to study and advance her knowledge. She says that her motivation comes from wanting to be promoted at work and from wanting to be able to continue to help her family. She typically sends 75% of her monthly salary, keeping only the minimum of what she needs to live in the city. Veasna’s goal is to become the assistant manager of the restaurant in the hotel that she is now working at. My attitude has changed. In the village, I was quiet. Now, with my friends from EGBOK, I am more confident and enjoy talking and hanging out with others.